I had a son and his name was John. He disappeared into the vaulted darkness one Friday of All Souls. throwing a little tin pail at the heart of the priest. I knocked on the coffins. My son! My son! My son! down which the carts vanish. I had a fish dead under the ashes of the incense burner. I had an ocean. Of what? Good Lord! An ocean! were eating the spring wheat. where the goblets full of tears were whirling. In the anemones of the offertory I will find you, my love! to scare the nighttime toads that roam in the icy landscapes of the chalice. but the dead are stronger and know how to gobble down pieces of the sky. to be raped and wounded by the mobs from the regiment. If my son had only been a bear! I’ll roll myself in this rough canvas so as not to feel the chill of the mosses. and it was no one else’s, because it was his son! His son! His son! His son! 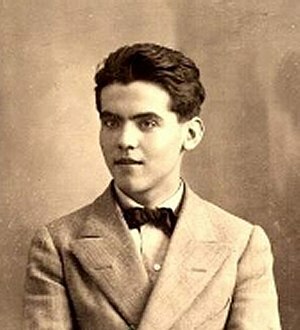 Lorca is mad with grief—so mad that he is almost impossible to understand, at times. (Again, it may be that a little of this obscurity is because I’m reliant on the translator, although there is so much mystery here, and Bly is so well-regarded as a translator, that I have to believe at least most of the whirling chaos is Lorca’s.) I’ll cling to the pieces of driftwood that surface fastest for me, the phrases that I can make sense of soonest, and work outward from there. Lorca is channeling the grief of a father at wartime—he himself was only 20 when the First World War ended, and did not lose a son in that conflict—and the first three lines grab me by the throat. They are the words of a man about to lose his ability to speak, his throat quivering and about to seize shut, sticking to the simplest of facts before the darkness engulfs him and me and the whole poem with it. The poem’s final three lines are a maelstrom of that singular grief, as the speaker keens out the word “son” over and over like a mantra, or a charge against the world. Maybe both. Whatever else the poem says, most simply it speaks that loss, and that anger. In-between, we are in a private universe made ludicrous and appalling by sorrow. The speaker’s phantasmagoria produces confusion if we try to read every image literally, but the recurring emotions and notions in this dreamscape are consistent enough for me to make some sense of it. At the heart of the poem, everything is turning to dust and destruction—fish burn to ashes, fruit decays and fills with worms, giants lift animals to be sacrificed and swallow the sky. Images that recur become more violent each time—the fish, which at first is an inscrutable metaphor connected with cart-filled streets, becomes an image of death; the ocean, which at first is merely a baffling possession of the speaker’s, becomes a terrified victim of horrific sexual assault. Wherever the speaker has gone, deep inside himself, there it is cold and remote and savage. He is on the verge of taking his own life (I think—can we make anything else of what he might do with a necktie or a sleeve in this context but some kind of jailhouse suicide?). The poem’s subtitle suggests that it considers the First World War, although to call this an “anti-war poem” is to oversimplify it, I think—the rage and fear inside it reach far past war, for me, into death certainly, and I feel as though Lorca is wrestling with things even more elemental (if there’s anything more elemental than life and death). To go beyond this is to enter a realm of interpretation where I feel very unsteady. What does it mean that he sees his daughter as a fish, given the other fish imagery in the poem? Connecting the fish images with the ocean images, and them to the canvas (sail?) and rudder later in the poem, is there an overarching “at sea” design to the poem that might unify more of the poem than I see at present? When I try for this, I get a bit worried—if he is in a boat, where is he going, and what would it be like for him to arrive? I’m unsure. I haven’t even gotten to the imagery of the Mass and the priest (and the church of the title), which I can easily see as real events that the father is going through…although should I see it instead as being a vision, no more real than the carts rolling along on a fish? And what on earth can we do with the secrecy of the crocodiles, or the insanity of the penguins…images so bizarre that in almost any other contexts they would inspire a grin, but in this setting exude a horror that I cannot quite pin down? Lorca is trying to plumb the depths of something humans cannot “word” into meaning—wherever it is inside us that we feel the anguish of a lost child, there are clearly no straight roads from there to the centers of the brain where language is made. We all know this, from experience, even if we have not felt griefs exactly like this man whose son is dead. But there is something very powerful, and also shocking (overly intimate? even perhaps embarrassingly so?) about seeing someone reduced to this wordlessness and following him to the place where the words no longer make sense. Emotions resonate for me from inside this poem that are incredibly powerful, but I struggle to identify what exactly they are. This is another thing poetry does for us—while at times (as with some of my recent 1936 examples) poetry is a reveling in language and the structure of language, here the freedom of poetry allows us to “get around language” in a way that prose hardly can. In all my life, I will probably never be able to say what or where the “anemones of the offertory” are, but when I reach that line I cannot help but be present beside them as this man and John and the priest are, alive but devoured in the belly of the thing called death. I am grateful, too, that there are other poems that help me to deal, also in a way almost beyond words, with death in a way that brings peace and not terror. I know I will work with one of them again, sometime soon. For tonight, I’ll be here in the vaulted darkness, and if any of you pass this way too, I hope you’ll feel free to leave comments, however brief or mysterious, in response to Lorca.